To Preserve Golden Pippins -- Mrs. [Twine?] 13 To one pound of pippins pared and cored allow one pound of sugar the finer the better, put to it a quart of water, set it on the fire in a stew pan and let it boil, scum it well then put in the pippins and let them boil very quick till they look clear, which will be near two Hours, they must be often turned in the stewing, when they are enough lay them in a dish you mean to serve them in, then squeeze the juice of a lemon into the syrup, and give it a heat, not to boil, strain it through a sive upon the apples, and when cold it will jelly round the apples. 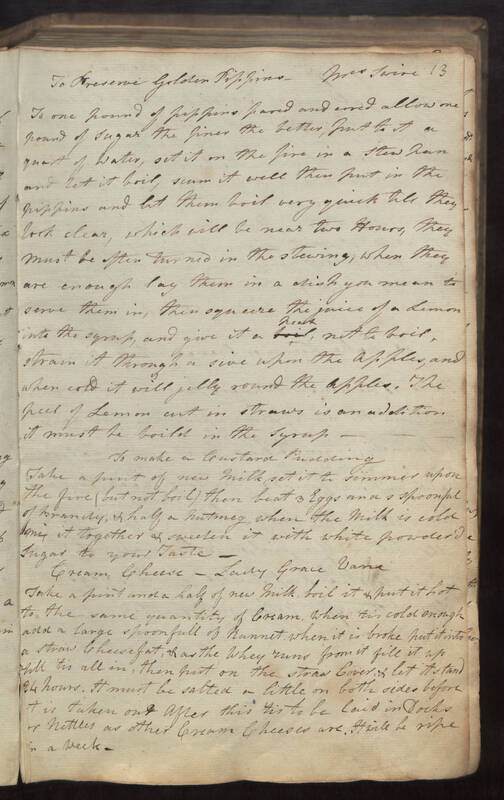 The peel of Lemon cut in straws is an addition it must be boild in the syrup.-- To make a Custard Pudding Take a pint of new milk, set it to simmer upon the fire (but not boil) then beat 3 Eggs and a spoonful of brandy, and half a nutmeg, when the milk is cold mix it together & sweeten it with white powder'd sugar to your Taste. Cream Cheese -- Lady Grace Vane Take a pint and a half of new milk, boil it & put it hot to the same quantity of cream, when 'tis cold enough add a large spoon full of Rannet. when it is broke put it into a strain cheesefat, & as the whey runs from it fill it up till 'tis all in, then put on the straw cover, & let it stand 24 hours. It must be salted a little on both sides before it is taken out after this 'tis to be laid in [rocks?] or nettles as other Cream Cheeses are. It will be ripe in a week.